I’ve just been turned on to Photofly 2.0, offered for download by Autodesk through their Labs Utilities Project (see http://labs.autodesk.com/utilities/photo_scene_editor/). 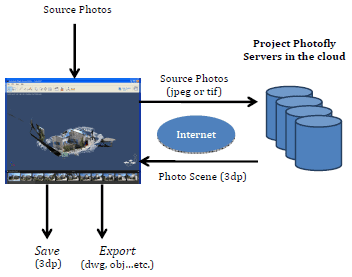 Photofly claims to allow users to create three-dimensional objects and interiors through cloud-computing analysis of photographs taken around, above, and below subjects in 5 to 10 degree increments with at least 50% overlap. After analysis and object creation, users can export DWG files to be manipulated within AutoCAD platforms. I will be testing this over the next few weeks and will follow up with a the results. If the program works as well as the Autodesk YouTube videos claim, this may be a very useful tool to employ in our own environments projects moving forward.